In the mid 1800’s Czechoslovakian (“Czech”) immigrants began a 17-week journey from their European homeland to Galveston, Texas. They, as many peoples did, came to America for the opportunity to work toward a better life. They also worked hard to retain their heritage in this new land; and food, including the Kolache, was an important part of this preservation. (See “The Czechs of Texas”- Texas Almanac 2000-01). The Kolache, a slightly sweetened yeast dough, was a delightful dessert that complemented Czech meals. The traditional Kolache was filled with apricot, cottage cheese, poppy seed and/or lekvar (prune butter). However, this beautiful bread-dough is also scrumptious when filled with a variety of fruits, meats, cheeses and/or vegetables as well. Kristi DeMaiolo Harper, owner of Café Kolache, spent 11 years in Houston, Texas and it was there that she, like many others, came to appreciate this “fun-food” of the Czech people. 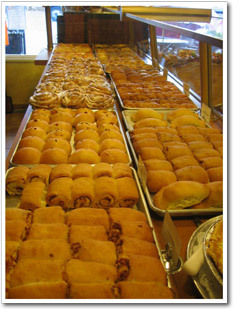 The Texas cities of Austin, Dallas and Houston have numerous Kolache shops; and Kolache Festivals are annual events in towns like Caldwell and West, Texas. 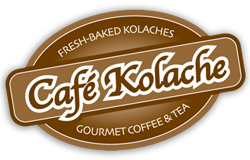 However, while the Czech culture is a notable one in the Pittsburgh area, kolaches were most often enjoyed by families in their own homes using great-grandma’s recipe…until Cafe Kolache opened in early 2003.